Hilary Cantor is a good person, but like all good people, she has seen her share of hardship. A single mother of a son with Asperger’s syndrome, she has been working hard to maintain a quality life for herself and her son. Despite her best efforts, her world has begun to drop out from under her. Her deadbeat ex-husband is waning in his financial and emotional support, her bills have begun to stack up, and she has recently become a victim of the recession when she loses her job. Facing bankruptcy for herself and the possibility of losing the ability to properly care for her son, she makes a final trek to beg for her ex’s assistance. On her way through the country to try and right her upended life, a miracle occurs. When Hilary witnesses a freak car accident and stops to help, she finds what seems to be a godsend… a bag containing $500,000. In the split second before someone else arrives on scene, Hilary makes the decision to keep the money. With the money, Hilary begins to fix her life; she pays off her debts and even makes sure that the money is not missed. However, no miracle comes without a price, and for anyone to make money, someone else has to lose it. When another person associated with the crash is found dead it becomes apparent that the money is missed, and the owner is determined to get it back. Pursued by a ruthless hired gun, Hilary must work with the son of the crash victim and trace the origin of the money through death, desolation and 20 years of history before it’s too late for her and her son. 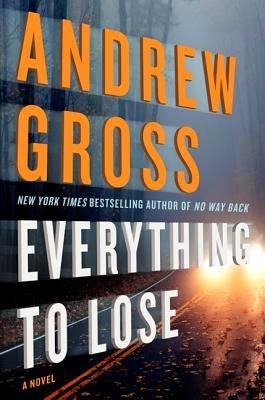 Andrew Gross produces a thrilling journey in Everything To Lose. The main protagonist is relatable and well rounded. Further, Hilary is filled with a sense of morality that closely mirrors what would be expected of anyone else facing her situation. The writing is typical of the genre and kept me engaged throughout my reading. Despite the fact that I thoroughly enjoyed this book, I couldn’t help but compare the plot to that of No Country for Old Men. While the books did not share an atmosphere, setting or writing style, I continuously drew connections to characters and plot points from the earlier novel. However, this did not detract from my enjoyment, and I am now excited to read more of Gross’s work. I would highly recommend this as a fast-paced, plot-driven thriller that could easily consume a weekend. I have a tumultuous relationship with Dr. Kay Scarpetta. Author Patricia Cornwell captured my imagination with her first books featuring the famed medical examiner, but I soon became burned out. Cornwell has a knack for the kind of complex and disturbing stories that leave mystery buffs like myself reeling, but I found that I was losing interest in her protagonist. After a couple solid installments at the start of the series, Scarpetta became less likable, and I found myself caring less and less about her. After reading the first five Scarpetta novels, I decided to take a break from the series. Knowing that my taste in reading material has evolved over the years, however, I decided to give Scarpetta another go. 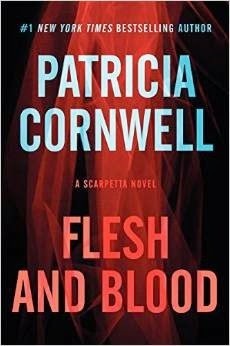 Flesh and Blood marks the 22nd book in the Scarpetta anthology. Kay Scarpetta, now the chief medical examiner, is preparing for a tropical birthday vacation with her FBI profiler husband, Benton Wesley. The trip serves as a much needed break for the hard working couple who rarely get time to themselves. As they are enjoying what should be a relaxing morning at home, Kay notices seven pennies lining the wall of her garden. Each penny has been meticulously arranged, polished, and dated 1981. As she questions the meaning of the objects, Scarpetta is called to the scene of a murder that occurred nearby. She joins her longtime comrade, detective Pete Marino, at the investigation site. The victim, a music teacher who gained notoriety after being falsely accused of terrorism a few years earlier, was shot by a sniper while unloading groceries. Amidst the panic and confusion that surrounds the crime scene, one thing is certain. . . Scarpetta's vacation will have to wait. The sniper rifle allowed the killer to remain distant from the scene, a fact that results in a disappointing lack of physical evidence. Autopsy results confirm the cause of death, but offer little in terms of identifying the killer. The bullet recovered from the victim's body presents more questions than answers. Formed from polished copper, the bullet is an unusual choice for sniper rifle ammunition. As Scarpetta thinks back to the pennies on her garden wall, she recalls a string of odd tweets from a user named Copperhead. When Marino informs her of two other sniper murders, both where copper traces were found at the scene, it becomes clear that Kay was meant to find those pennies. Someone is sending her a message. Someone is toying with her emotions. Someone is threatening her life. I find my reaction to Flesh and Blood quite similar to the reaction I had to Cornwell's early novels. There are genuine thrills in this story that sent chills down my spine. The threat of the killer draws upon reality (the D.C. sniper comes to mind), allowing for the reader's imagination to come to conclusions far more terrifying than anything that is printed on the page. Seemingly unconnected points come together in shocking ways, providing the kind of satisfaction that mystery readers crave. Unfortunately, Scarpetta's advanced position at the medical examiners office makes her much more hands off that she was in the earlier novels. Rather than personally inspect the bodies, she comes to conclusions based upon the insight, or lack thereof, of the examiners working beneath her. This makes the investigation and revelations a bit flat. Further, the self absorption of many of the main characters makes them hard to root for. After a promising opening and several fantastic twists, Cornwell ends her novel with the whimper of a cliffhanger, a trend that many mystery series authors seem to be taking. For the sake of completion, I'll probably read the next Scarpetta novel, but the disappointing conclusion of this one leaves me wary of continuing the series beyond that. Thom and Jennifer Harlow are Hollywood's celebrity power couple. Good looks, talent, kind hearts. . . the couple has it all. Paying forward their critical and financial success, the two sponsor schools in impoverished nations and even adopted three children from the countries they serve. As they near the completion of their magnum opus Saigon Falls, the entire Harlow family vanishes. No one in the Harlow's inner circle seems to have any idea as to the couple's whereabouts. Even worse, none of them want to threaten their employer's project by making the disappearance public. Enter Jack Morgan, owner and head of Private, a world-wide investigation firm. He is hired by the Harlow's lawyer to locate the couple. Jack learns that the Harlow's passion project, which they have written, directed, and star in, is so risky that most of the studios refused to invest in it. Despite the desire of the staff to maintain their client's pristine image, Jack's investigation begins to show cracks in the Harlow's picture perfect facade. Probes into the couple's well protected life bring revelations of financial troubles, fraud, and disturbing fetishes that all factor in to the shocking truth behind their disappearance. As if Jack's plate wasn't full enough, he is contracted by the city of Los Angeles to intervene in a very public terrorist attack. A group called 'No Prisoners' has leveled a full scale strike against the citizens of the city, sending residents into complete panic. Massacres occur at random locations as the Jack and the city seek to find the people responsible for the horrific acts. Whether you are a fan or not, there is no denying that James Patterson delivers tight, entertaining thrillers. Patterson and co-author Mark Sullivan continue the Private series of novels with the fast pace, interesting characters, and suspenseful twists that readers have come to expect. While the authors tell the reader that the Harlows are a great couple, they don't do much to actually establish sympathy for the family. Consequently, the mystery of the Harlow couple becomes overshadowed by the No Prisoners plot. Despite a few unexpected twists, both narratives come to predictable conclusions. 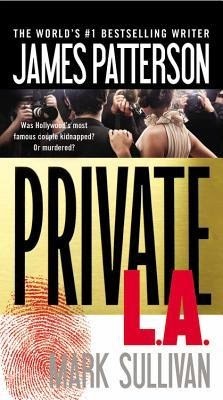 Even so, it is Patterson's penchant for alluring protagonists and breakneck thrills that makes Private LA a gratifying experience. Angelina Jolie follows up her directorial debut, In the Land of Blood and Honey, with Unbroken, a film adaptation of Laura Hillenbrand's account of the fascinating life of Louis Zamperini. I read the fantastic book in 2010, and was enamored with the story of the incredible Zamperini and all of his accomplishments. Jolie seemed like an odd choice to direct this serious drama, but I entered the theater prepared for the inspiring story that the book portrayed. The film opens with Louis(Jack O'Connell) on board an American WWII bomber. Zamperini's charisma is apparent as he jokes with his comrades during the tense mission. Immediately, his will is tested as his plane faces a retaliation attack from the Japanese forces. Louis remains calm as he fights to overcome these insurmountable odds. . . a theme that seems to be at the heart of Jolie's film. A flashback reveals a young Louis who is bullied by his classmates for being the son of Italian immigrants. Encouraged by his older brother who reminds him that "a lifetime of glory is worth a moment of pain," he uses this trauma to fuel his training as a track runner. Soon, he qualifies for the 1936 Olympics, where he runs a record earning final lap. As he prepares for the upcoming Tokyo Olympics, WWII breaks out, and Louis's Olympic dreams are put on hold. It is during the years of the war that his will is truly tested. Engine failure leaves Louis stranded in the ocean with two others for over 40 days, only to be rescued by Japanese forces who promptly place them in a POW camp. In the camp, Louis is faced with sadistic physical and psychological torture. There is no denying the skill and care that this movie has been made with. Both on and off screen talent put in a commendable effort in portraying this fascinating story. Unfortunately, the emotional heft of the book is absent in the film. In the book, Louis faces tremendous obstacles including alcoholism and domestic violence, all stemming from the residual PTSD from his 2 1/2 years in the camp. He doesn't find true redemption until he commits his life to his religion. In the film, all events following the camp are relegated to a brief caption before the credits. 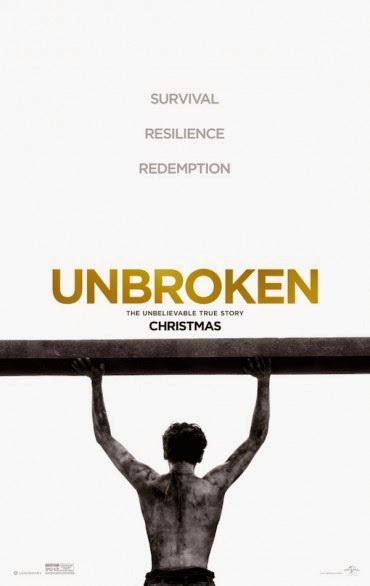 This denies the story the emotional turmoil and restitution that makes Zamperini's life so inspiring. Instead, the film makes Louis into a kind of super human who, no mater the obstacle (the torture scenes are quite long and graphic), suffers through and overcomes. In the end, the film ends up being serviceable, but never the inspiring story of redemption that it deserves to be. Over the past few years, The Hunger Games has become a high profile franchise on the same level as Twilight and Harry Potter. The combination of young adult fantasy and political thriller has helped the series to capture the imagination of fans of all ages. After hesitantly reading the first novel in the series, I too found myself sucked into the political and emotional turmoil that permeates the trilogy. 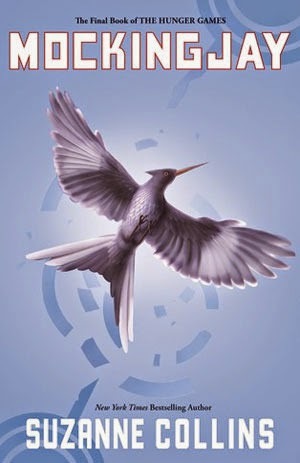 Mockingjay, the final installment in the Hunger Games Trilogy, begins where the previous novel left off. Katniss Everdeen has escaped the horrific arena of the Quarter Quell and joins her family in taking refuge with the rebels of District 13. President Snow and the Capitol's power are extremely weak, and Panem is on the brink of another Revolution. The rebels of District 13, led by their elected leader President Coin, have all the resources to battle the Capitol and free the enslaved citizens of the other twelve districts. Katniss, they believe, is the final piece to their intricate battle plan. As their "Mockingjay", Katniss would become the face of the revolution, a symbol of the resistance, and the person who unites the citizens of the other districts in their fight against the Capitol regime. But Katniss isn't sure that she's up for the challenge. Two appearances in The Hunger Games have left her physically and emotionally exhausted. Her body is still recovering from the bolt of electricity that allowed for her escape from the arena. Her heart aches from her frayed relationship with her childhood friend, Gale. And poor Peeta, who sacrificed his own well being for Katniss's safety, was left in the arena during her rescue. Now he is in the custody of the Capitol, being tortured and used as a mouthpiece for President Snow. With the fate of the revolution lying in her hands, Katniss is forced to face her own demons as she fights for the freedom of Panem. This is the weakest installment in the series. While the previous two novels effortlessly flowed, Mockingjay moves at a tedious pace as Collins seems to struggle to complete her trilogy. I enjoyed the underlying political aspects of the story, but they seemed to weigh down the plot with unnecessary moments of exposition. After the events of the other books in the series, it was nice to see the characters finally reflect upon their actions, especially when Katniss is given the time to grieve for the loss of her innocence. Unfortunately, the chance for nail-biting action and suspense is lost as Collins tells the audience that certain events happen, rather than allowing for readers to experience the events firsthand. The ending inevitably ties up all of the loose ends of the story, but ultimately feels contrived and falls flat. Readers of the previous novels should definitely complete the series, but be prepared to be disappointed in the lackluster conclusion to this otherwise exceptional trilogy.